The Justice and Construction party (J&C) has announced that it plans to sue Khalifa Ghwell, the former Tripoli regime prime minister and leader of the recent coup attempt against the Presidency Council, over allegations that he accused the party of destroying the country. 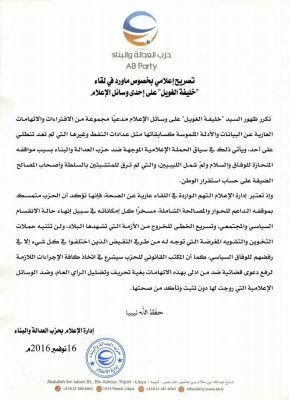 In a press release, the J&C, the political arm of the Muslim Brotherhood in Libya, said that Ghwell was trying of mislead the public by his false accusations. It added that it would also sue those media outlets that had published his statements. Those statement shad been repeated in a number media outlets, the J&C said, insisting they were lies. It was, it added, all part of a campaign against the party because it was trying to encourage peace and unity in the country. Confirming that it would continue making every effort to end the splits in the country, the J&C also said that it would continue to support dialogue and reconciliation. Ghwell criticised the party during an interview with Libya Al-Hadth TV two days ago. It was not the first time that he has attacked the Brotherhood. He previously accused them of being linked to masonry and having an agenda that was against the interests of Libyans. Ghwell and the J&C were strong allies when Libya Dawn was in control of Tripoli in in 2014. But they parted ways when the Brotherhood decided to back the Skhirat talks and then support the Libyan Political Agreement. Ghwell remains adamantly opposed to it. Despite, expectations that last month’s coup bid by him and his cohorts would quickly dissipate, he continues to have a degree of power in Tripoli. This may not be unconnected with allegations that he has access to some LD 100 million. This would be more than enough to retain the support of a significant number of militias in the capital for many months to come.